Working is easier when your desk looks cute, right? ​Having a productive work day starts with having a great space to work. Okay, okay maybe it starts with coffee before that, but we really believe that the best work happens when you're in a space that pleases your senses. Maybe that means burning a candle for an hour to refresh the air. Maybe that means wiping everything down with a Clorox wipe and having a clean slate, literally. Whether you work from home or in an office, your desk is your haven. We think it deserves to be styled the same way you might style your vanity or your coffee table, with fun accessories that also help you stay organized and on-task. A sticky note never looked so good, right? We love all things personalized from Mark & Graham, but these cubes of notes strike us as particularly awesome. 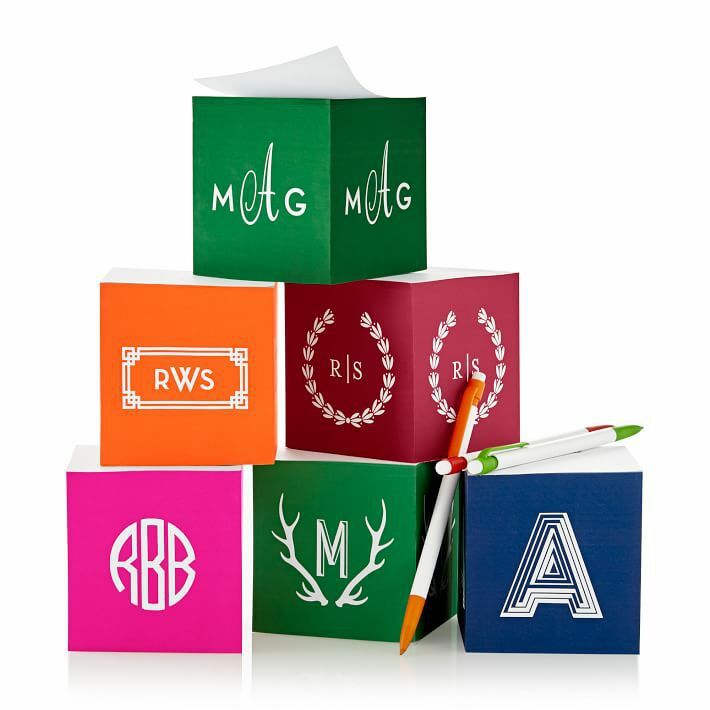 Treat yourself or give one as a gift—they can be personalized with names and monograms in an array of rich colors. To maintain power at all times while still looking polished and professional, you need one of these wireless charging stations from Pottery Barn. Along with docks and plugs for your phone and tablet, this station also has a spot for notebooks and papers so everything is in its place. We can always count on Target's in-house brand, Threshold, to provide fun and stylish home accessories at an amazing price. To organize magazines (and mail!) buy a trio of these gold files and store them with the shorter end facing away from you. This creates a more streamlined appearance but you can still see what each one contains. When it comes to styling your workspace, symmetry and matching sets are always a good bet. This way you can keep a simplified aesthetic while having each thing in its place. What is there to say about this tape dispenser except that it is the most stylish tape dispenser we've ever seen? Bandō has a whole portion of their website devoted to quirky and cool desk accessories—this is just one of our favorites. Hello, it's me. We know landlines are falling out of fashion these days and most of us conduct our business on cell phones, but there's something so irresistibly charming about an old school desk phone. Channel your inner Peggy Olsen and take your next call on this stylish silver phone from Pottery Barn. Do you have a friend just starting a new job or recently embarking on her career? This monogrammed pen cup from Mark & Graham would make the most perfect gift to help your friend feel at home (and inspired!) at her new desk. There's something really comforting about working by lamp light, isn't there? We always find so many cool and sleek decor and accessories from Zara Home, and this recent discovery has us swooning. The glass look could work with a shabby chic farmhouse aesthetic or a preppy, classic look, too. A less than $200, you get a lot of look without breaking the bank. For quirky characters and artistic types, a mini light box is a fun desk accessory to remind you of your mantra or just to grab that next cup of coffee. Did you even now a stapler could be this beautiful? We didn't, but thanks to Typo (a brand you'll find on Cotton On's website) we're now reeling from the glamour. Just imagine how much better you'll feel putting together that next report when you can use this stapler to do it. 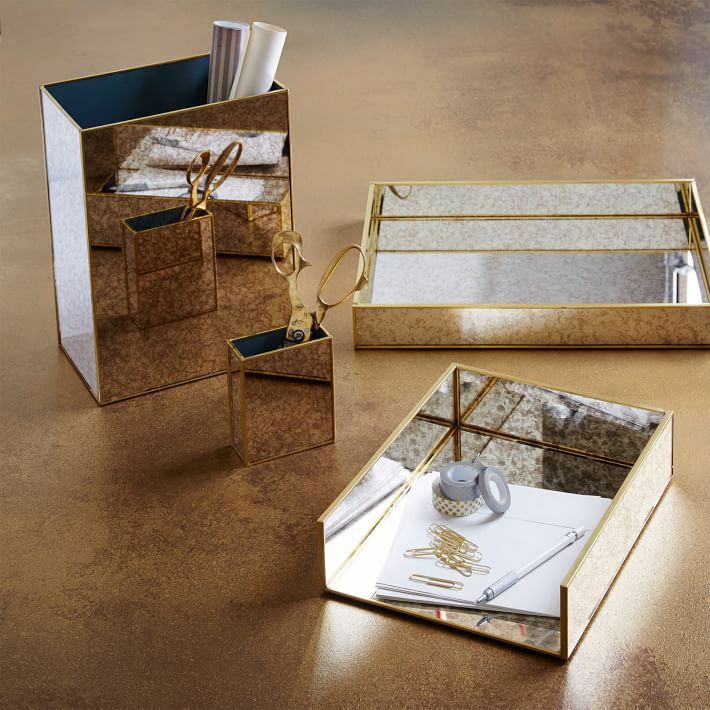 Keep your mail stored in style with this hammered metallic piece from Nate Berkus for Target. If you couldn't tell already, we might be slightly biased towards any and all desk accessories with metallic accents. We've never met a pretty glass box we didn't like. This $15 find from Zara Home could hold anything from business cards to extra device cords or paper clips and knick-knacks. Write on! We still love to keep notes and make to-do lists with a pen and paper, and these colorful notebooks from Poppin (that come in a box that displays their rainbow-colored spines) could last us through months and months of doodles and deep thoughts. Sometimes you can't ask, "Why?" but rather just say, "Why not!" and buy the scissors shaped like the Eiffel Tower. Leave it to Kate Spade to box up a set of the most gorgeous and uniformly sophisticated pens. Keep these in Mark & Graham's copper pen cup and you'll be the shining star of your office—literally! Tons of Product and Business Ideas for Your Modern Homestead.